The FOSTCDR is our industrial serial to multimode fiber optic converter. 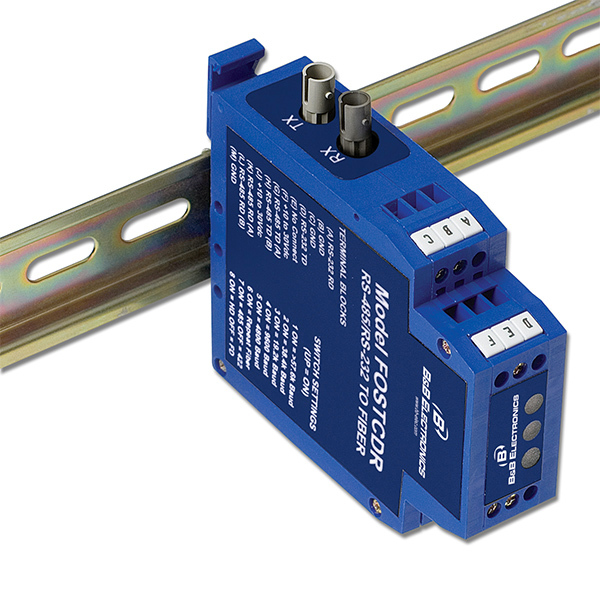 Designed for industry, it extends serial data range up to 2.5 miles and provides the most versatile connection possible between any asynchronous full or half-duplex serial equipment. In addition to direct point-to-point connectivity, it is capable operating in a multi-drop mode. This allows one serial device to communicate with up to 31 others around a fiber optic ring. Since it supports mixed serial standards, you can replace other converters and isolators and add the EMI/RFI immunity inherent to fibe roptic communications. In RS232 mode, the FOSTCDR supports transmit and receive data. Handshaking signals are not passed through. An Automatic Send Data Control circuit controls the RS422/485 driver chip, eliminating the requirement for special software. Easy to install and configure, the FOSTCDR serial to fiber optic converter has an 8 position DIP Switch to set up the RS422/485 parameters and terminal blocks to connect serial signals and power.